Home ~ Friendship Is Magic Voice Chat: Update! Blurb A friendlier way to chat, because ponies. Now 20% cooler. Red Eclipse's voice commands are alright, but have you ever wanted something different? More diverse, more tactical, more... friendly? Look no further. 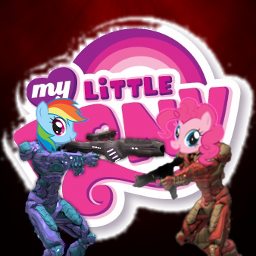 You don't necessarily need to be a Brony to appreciate this mod. (I don't really consider myself one). I've tried to make these voice commands as useful on the battlefield as possible, and they can can be perfectly relevant in casual conversation even if it has nothing to do with ponies. Alone in enemy territory with the flag? Press X-F-4 for Fluttershy saying "I need your help". Newcomer derping around? X-D-6 gets "Careful, Derpy!". Just trounced a foe with your accurate SMG skills? X-P-6 makes Pinkiepie exclaim, "Holy moly, that's a lot of hole-ies!". Also includes the CSI Miami sample of Won't Get Fooled Again ("YEEEEAAAHH!). Not that Horatio makes a cameo, I just thought a decent voice chat mod should have it. -11 New sounds: "CHAAAARGE! ","yay", "you rock! woohoo", "FOREEEEVER! ", "eeyup", "gotcha", "the fun has been doubled! ", "my bad", "I just don't know what went wrong"(both original derpy, of course), "OH COME ON! ", "Mwahahah! You can run, but you can't hide! "(Queen Chrysalis). More information, as well as a complete list of sounds, can be found here. Seems to be more personal, but is it also having sense in it? I thought using different ports for each server should fix that problem, not sure though. Thanks for the advice. Port forwarding makes me want to hang myself tho... and now that I think about it, I'm not so sure I want to make another server for people with this mod. RE already has a lot of servers, and I still want to devote most of my time to maintaining my Secret Killer Mode server. And yeah, it's a "just for fun" mod, but it can be useful. I might or might not come out with a "serious" version later. This is for Red Eclipse. And more than half of the players in any game are kids. Get over your butthurt. that doesn't change the fact that the game is unsuitable for kids. Is this node up to date?